A number of new routes were introduced in central London during late 2002 and early 2003, in preparation for the introduction of Ken Livingstone's congestion charge. Although many were just splits of existing routes, some innovative new links were created. Undoubtedly the most successful of these routes is the 148, which plugged a number of obvious gaps in the previous network, and which has been operated very reliably by London United from the outset. In particular, previously all routes running eastwards from Victoria via Victoria Street turned north along Whitehall or to Waterloo, so the 148 provides a direct link between Walworth and Elephant & Castle and Victoria for the first time. The Elephant is of course a major interchange with other routes, such as those from the Old Kent Road. A similar south to west link is provided at Marble Arch, and the 148 provides useful additional capacity along the Bayswater Road and through Notting Hill Gate, to relieve the 94. The 148 has had rather more than its fair share of new vehicles since then, having had no fewer than six separate batches allocated new to it in its first 5 years! The route was started off using Dennis Tridents borrowed from Tolworth garage – this was due to a change of plan on the start date. The VA class Volvo B7TLs originally ordered for the route were duly introduced a few months later. The original VAs were later supplemented by 6 VLE class long wheelbase Volvos with East Lancs bodywork, bought for a frequency increase from 6 November 2004. 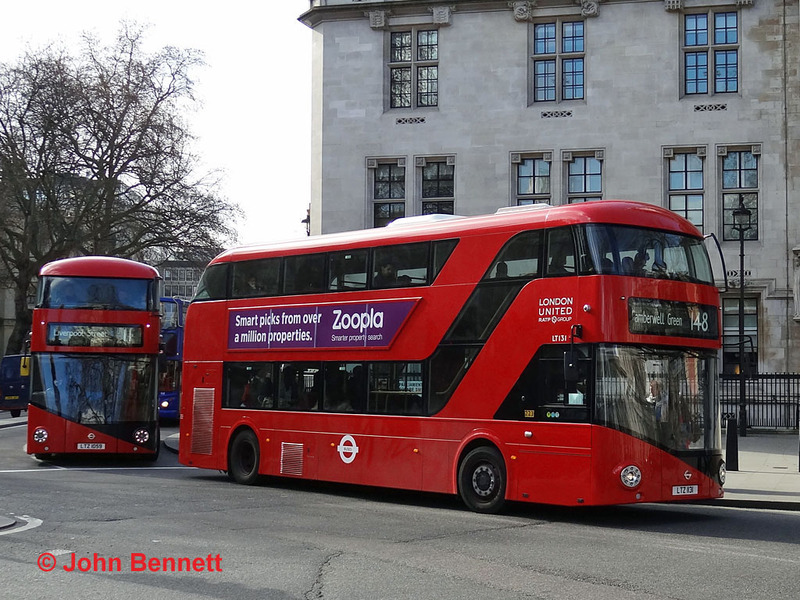 An increase would have been justified anyway, but the reason for this was the bendy bus conversion of route 12: due to a tight turn at Oxford Circus, the 12 had to be cut back from Notting Hill Gate to Oxford Circus. Other routes were altered to cover; in particular the 148 increase was to help passengers from Camberwell and Walworth who wished to travel through to Marble Arch or Notting Hill Gate. There are surprisingly many end-to-end passengers on the route, helped no doubt by the fact that it escapes most of the worst congestion and achieves the 8 mile journey in just over an hour, which is quite fast for a central London route, and considerably quicker than the 12 via Oxford Street. From 2006, the route was converted to SP class operation in stages, freeing up older buses for use elsewhere in the company, including newly won school routes 697 and 698. The VLEs moved to Stamford Brook garage to facilitate an increase on the 27 in 2006, prompting a second small batch of SPs, making 15 in all. There was also a batch of SO class Optare Olympus bodied Scanias, ordered against the extension of route 131 to Tooting and intended to replace the remaining VAs, but because of fundamental design issues, meaning they could not be certified for the required passenger capacity, these were short-lived. These, and the first 15 SPs which had been built to a low height specification, were replaced by a whole batch of later model SPs in 2009. 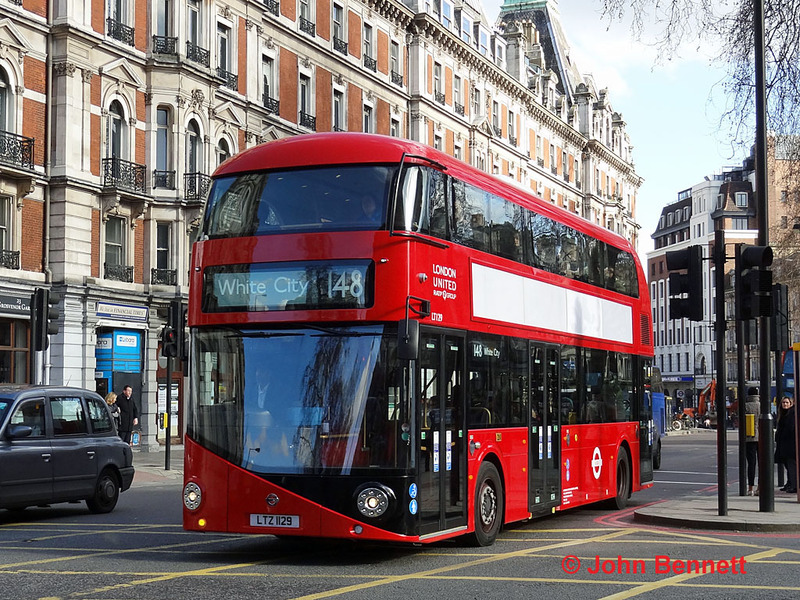 These managed about 5 years on the route, but the 148 is the latest route to be selected for conversion to the new "Borismaster" type, partly because the option was there to cascade the SPs to route 281. This is the 8th batch of new buses allocated to the 148! LT129 (LTZ 1129) passes along Grosvenor Gardens, Victoria, on Wednesday 26 February 2014, in the second week of LT operation. Somewhat controversially, the route operates in full-OPO mode, that is to say that no conductors are employed. This means that the rear platform is closed at all times (other than at stops), as can indeed be seen in this view. This may seem like a waste of new technology designed very much around two-person operation, although the benefits of three doors and two staircases (a long-held ambition of TfL) still exist. 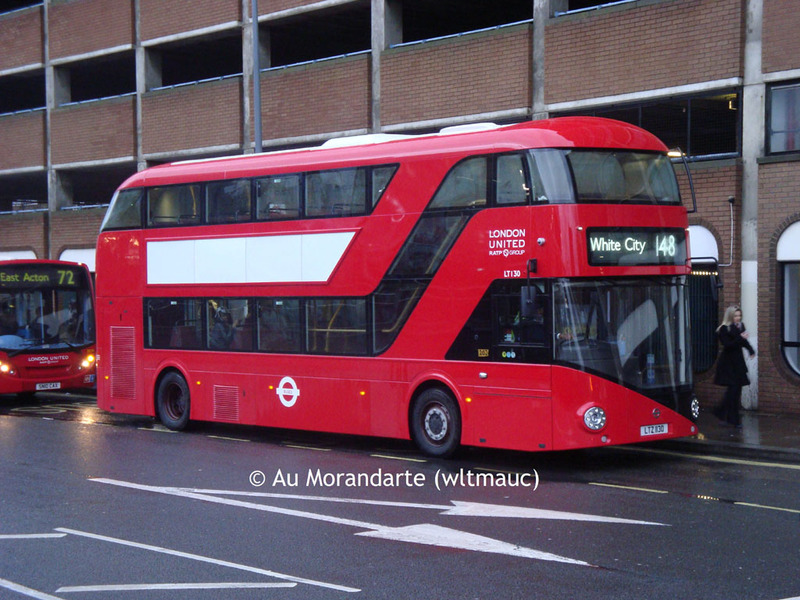 An offside view is provided by LT130 (LTZ 1130) in Wood Lane at White City on 14 February 2014. The 148 used to terminate in Shepherd's Bush garage, but opening of Westfield cause the extension the short distance to White City. Unlike other routes which use the internal access road within the complex, the 148 uses public roads to get to White City, mainly so as to provide common stops with the 94 on Shepherd's Bush Green. The final stop is in the bus station behind the photographer, but the absurd road layout means that it will take the bus 3 or 4 minutes to get there, which is no doubt why everybody has already got off! In fact, this extension was very wasteful, carrying few passengers but substantially increasing costs as the convenience of a garage terminus was removed. One final view is of LT131 (LTZ 1131) coming off Victoria Street into Parliament Square on the same date as the first photograph. Three of the four routes along Victoria Street now operate with these buses; whether that is pure coincidence, or partially intentional given that it passes the seat of government (replicating the "point" made by the award of route 24 to Grey-Green in 1988), is not known! As with the second view, the distinctive glass staircase panel can be seen.